This is the Qoros GQ3 – from a Chinese manufacturer looking at taking on the Focus and Golf. 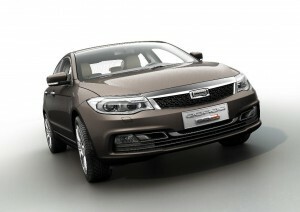 Chinese cars tend not to do well in crash tests, but Qoros says this one will be different and will achieve tops marks. It’s been designed by the same team behind the Mini revamp and, on the surface, their work looks good. It’s certainly got stand-out looks with some very obvious German design influences, and the interior is said to be ‘spacious’. The firm’s announcement also includes an industry first in that owners will have a clever touchscreen for their infotainment in the middle of the dashboard. They also say the interior sets new standards for Chinese manufacturers and they are keen to sell cars into Europe. To do that they aim to produce cars that are comparable with European manufacturers. That’s a big bold ambition – and something that other foreign carmakers have stumbled at. For a brand new car firm, Qoros will have their work cut out to make a dent into the market but if the GQ3 is priced well – and industry experts are saying it will start at around £15,000 – then we could be seeing a lot of these on our streets. Coupled with the push by Dacia and their low-cost, hi spec models, we might at last in the UK start to see cars that are similarly priced to other countries. The firms says it has other models in development so we can expect more announcements of their vehicles in the months to come. In the meantime, the GQ3 will make its debut at the Geneva Motor Show in March next year. This entry was posted in Cars, Manufacturer News, New Cars and tagged car, Chinese cars, Chinese manufacturer, Chinese manufacturers, dacia, Europe, Geneva Motor Show, Golf, gq3, LS, mini, MoT, New Chinese, price, qoros, qoros gq3, UK by Steve Lumley. Bookmark the permalink.